Tulane economics professor Doug Harris is the founder of Education Research Alliance (ERA), an “initiative” housed on the seventh floor of Tulane’s school of medicine (1555 Poydras Street, New Orleans) with the Cowen Institute and other pro-privatization organizations, such as Michelle Rhee’s The New Teacher Project (TNTP) and Sarah Usdin’s New Schools for New Orleans (NSNO)– Usdin being the former Teach for America Executive Director of Louisiana and childhood friend of New-Orleans-School-state-takeover legislation, Act 35 “mother” Leslie Jacobs. 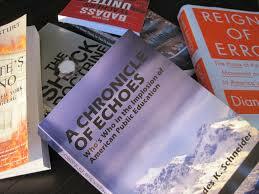 Harris’ title is “Endowed Chair in Public Education,” yet the person(s) paying Harris endowment remains a mystery. And his title of “chair in public education” lends to the misconception that Harris has a background as a K12 classroom teacher and/or administrator, which he does not. Harris’ ERA is also funded via a $3 million grant from the pro-charter Arnold Foundation. Harris’ research expertise includes value-added modeling (VAM), which he believes is a suitable means of measuring student “growth”– “growth” being narrowly defined as changes in student test scores from year to year. In short, VAM formulas determine what “growth” is “enough,” and teachers whose students “grow” as evidenced by their standardized test scores are determined to be “effective.” Harris believes that VAM is reliable enough to be incorporated in Louisiana’s school performance scores (SPS), as well. As to data on now-100-percent charter Recovery School District (RSD), Harris apparently has access that has been denied to other local researchers, even despite court order that the state to non-selectively release de-identified student data– which means no requiring organizations to offer justification for the request. Harris’ ERA is also hosting a post-Katrina, tenth-anniversary event in June 2015. When I initially read the announcement in December 2014 (sent to me second-hand), admission to the event was “invitation only.” I later also learned that New Orleans education researcher Kristin Buras was “invited” to sit in the audience. All of the above information on Harris prompted me to write this December 26, 2014, post on the “invitation only” June 2015 event and this January 7, 2015, post on his vision for Louisiana SPS. On January 7, 2015, I received an email from Harris via ERA. The email was a media advisory on ERA’s “First Report on School Choice,” a study Harris and another Tulane researcher conducted on the open enrollment application for most New Orleans schools, the Walton-funded OneApp. The official event for publicizing the study was a community meeting 6 – 8 p.m. at the Treme Community Center in New Orleans. Moreover, the study was to be made available early to “approved media representatives” by request. One of my criticisms of Harris in my December 26, 2014, post was his holding community meetings in the middle of the work day and at the Tulane school of medicine address, where parking is limited. Whereas those midday meeting continue, I was glad to see that the January 15, 2015 meeting was scheduled in the evening at a community center with easy parking. I was also curious to see whether I would qualify as an “approved media representative” and thereby allowed to view a copy of Harris’ report prior to his official presentation. As it turns out, I was “approved” (which I appreciate), and I wrote this January 15, 2015, commentary, which I published no sooner than midnight on the 15th, according to ERA’s stipulations. Furthermore, I attended the January 15, 2015, community meeting. It was definitely worth my while. Harris held his meeting in an open area in the Treme Center, which presented a challenge due to the background noises common to a well-utilized community center, including loud music and discussion and the sounds of sporting events. Approximately 75 people attended Harris’ talk and the subsequent panel discussion. Audience shot. Harris is seated in the front row, second from left. I arrived 15 minutes into Harris’ talk on his analysis of the OneApp. I had already read the study, which I viewed as “safe research.” Harris analyzed a component of New Orleans privatization from within the imposed system. Harris did not question the system itself. He did not question the existence of the OneApp. He did not question the circumstances which brought about the OneApp, or the real-life ramifications of parents’ being forced to choose schools from an offered list and then having a computer program “decide” on the “best” outcome for as many applicant as possible. He and his assistant simply crunched data primarily collected via the 2013-14 OneApp. Harris’ findings included the following: 86 percent of parents utilized the OneApp; school letter grades were an indicator parents used in choosing schools; however, lower-income parents were less likely to choose schools with higher test scores or higher school letter grades, instead preferring schools closer to home (especially in lower grades) and having siblings in the same school. Parents of high school students were less likely to choose schools with weekend classes and more likely to choose based on “legacy name” of the school and the availability of extracurricular activities, such as football and band. Parents of elementary and middle school students were less likely to choose a school requiring longer driving distance and somewhat less likely to choose schools with extended school years. Though the details above are of some interest, the most informative parts of this event for me were the panel discussion, the informal, anecdotal discussion I had with some audience members during and following the event, and a brief discussion I had one-on-one with Harris at the end of the evening. After Harris spent about 25 minutes presenting his findings, the panel of five female parents/guardians spoke for perhaps an hour. 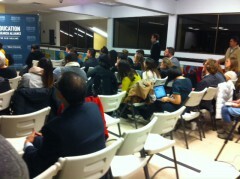 Also, throughout the evening, there were opportunities for the audience to ask questions. 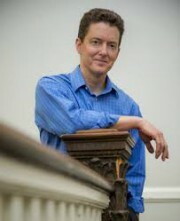 The panel was an important addition, for it added a personal component necessary to connect Harris’ efforts with his audience. The report alone was too academic. 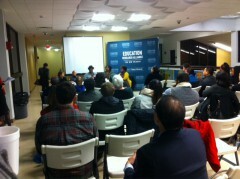 The panel was moderated by two groups: the Orleans Public Education Network and the New Orleans Parents Guide. From the back of the presentation area; the panel is up front. 1) The OneApp process is not quick, and it is not easy. (I wrote as much in this July 2013 post.) Many schools are listed on the OneApp have what one parent called “the fine print” of what is additionally required to be included with the OneApp. She said that if the instructions are not followed exactly, students can be denied admission. Another two parents talked about applying for pre-Kindergarten and ninth grade. Both stated that the process was grueling; that it was complicated and required perseverance– and that their flexible schedules and ready transportation made it possible to get through the process. 2) School letter grades are of some use, but they are not often a priority in choosing schools. The parents on this panel talked of their children’s happiness with their schools. They talked of the extracurricular offerings and of school reputation and school letter grades as often not coinciding. One parent said that her child was happy and brought home assignments that seemed appropriate despite the school’s having a low letter grade. Another parent said that the school letter grades were unreliable, that a school “could have an F one year and a B the next” (I thought of Pierre Capdau Elementary, which had an F in 2012-13 and a B in 2013-14), and she said that the choice for the most part was “between D and F or C and D,” that the letter grade range of available schools was limited to low grades. A third parent called the letter grades “a mirage.” Yet another parent commented on the A schools as being inaccessible because they are the selective admission schools. One parent stated that if the choice were two letter grades apart, like a B and a D school, she would likely choose the B school, but if the choice was only one letter grade difference, like a C and D, then extracurriculars would matter more. I cannot imagine being a parent of four young children assigned to four different schools. But this is the kind of real-life detail absent from an analysis of OneApp data, and it needs to have its place in the research on OneApp. I also learned from an audience member that the OneApp could assign students to attend a voucher school. The idea that voucher schools are included in the OneApp assignments appears underhanded and also warrants further investigation. During the January 15th community event, I asked a couple of questions. First, I asked Harris if he would be conducting a study detailing charter school turnover, teacher turnover in the charter schools, and (I included this from a previous audience member’s request) school relocation. He said he planned to study all of this. My second question was more of an observation following the panel discussion: Even though parents are often disregarding low school letter grades in making decisions of school quality, still those low school letter grades have the power to kill a school (though the final decision to kill a school rests with the state). I also mentioned the inflation of the school performance scores; how school letter grades can be manipulated by changes in the formula, and how John White withholds data from the public, a prime example being Louisiana State Superintendent John White’s refusal to publish the Class of 2014 ACT scores. One audience member told me that a KIPP school with a consistently low school grade is popular with parents because it has an arrangement to offer scholarships to a certain local college to some of its students. And now, to my discussion with Harris. He was kind enough to find me after the event ended to ask me what I thought of his presentation. I asked him, “You really want to know?” He responded yes. I said, “It was safe.” I told him that he stayed inside of examining what had been imposed on the New Orleans community post-Katrina. The “safety” comes in avoiding addressing (or even acknowledging) the imposition itself. During the presentation time, the last question an audience member asked Harris was whether the June event was open to the public. Harris said yes. I asked him about it. He told me that the June event would now be opened to the public. He said he thought of doing so originally but didn’t want “too much of one side” to dominate attending and that he wanted to be sure certain people did have the chance to attend. I asked if he would consider having Kristen Buras speak at the event. Harris said that he had bought her book and was in the process of reading it. He said that he was concerned about Buras’ “tone,” and he said that some information “was inaccurate.” However, he said he would consider having her speak. I did not have time to pursue discussion on what Harris thinks is inaccurate in Buras’ book. However, I hope he will write a review of her book and note specifically what he believes is inaccurate so that Buras might also address his judgment in writing. I observed, “I notice that you do not mention Act 35 and the legislature’s raising the score for a ‘failing school’ to 84.7, that it seems you are purposely staying neutral.” He said that he was not purposely avoiding writing about Act 35 but that yes, he was trying to stay neutral. And he commented that “both sides are mad at him” for doing so. In mind of Harris’ statement about Buras’ “tone,” I commented on my own hard treatment of him for his planning to exclude the public from his June event in my December 26,2014, post. I asked Harris, “You do realize that John White has created an atmosphere of mistrust by withholding data, selectively releasing data, and shaping school performance scores?” Harris did not respond. I asked again about his conducting research on charter churn, and he nodded and said, “I already have the data.” I asked him if he had to agree to any conditions connected to the data. He said no. But here is yet another problem: How is it that Harris is handed data that organizations like Research on Reforms must sue for and still have issues getting out of White? Harris could “neutrally” analyze the data and never allow himself to consider that his privileged access is inherently wrong. Via unbiased access, others should have begun analyzing this same data long ago. I did realize what Harris meant when he said, “Both sides are mad at me.” His OneApp report did not sound like any The Reforms Are Working propaganda coming from NSNO, or Leslie Jacobs’ Educate Now!, or the Caroline Roemer-Shirley’s Louisiana Association of Public Charter Schools (LAPCS). In short, Harris wasn’t living up to his Cowen Institute address. Even though Harris is trying to “remain neutral,” I am fairly certain that he will encounter resistance from John White for some of what he tries to offer even in the name of “neutrality.” Time will tell. In stating that those who had privatizing Act 35 imposed on them need a voice, am not advocating an emotional free-for-all at Harris’ June 2015 ERA event. There is a way to offer candid, emotional voice and maintain both order and a schedule. I hope Harris considers incorporating such opportunity into his event agenda. One final word: Even though Harris is a quantitative researcher, in order to be “balanced and comprehensive,” he will have to assign a greater role to qualitative research– especially to the experiences of those whose lives have been directly impacted by the loss of the community school. Community reality must not get lost in the convenience of quantitative reporting. Such a tender, delicate and sensitive man(?) this Harris dude. Come on Bub, the educational malpractices you support cause untold real harm not only to way too many students but also teachers, communities and public education in general. Come deal with those of us who can intellectually clean your clock made of VAM, vouchers and privatization. I hope they’re paying you enough so that you can somehow handle that ever so threatening “tone”. Jeez, what a wuss. Come on up to the Windy City at the end of April and experience the NPE conference.